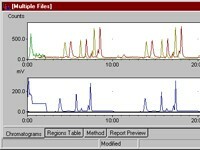 BioChrom is the industry standard radiochromatography software data system from LabLogic. It is a comprehensive chromatography data collection and analysis package that can be interfaced with several HPLC and TLC instruments. BioChrom includes specific instrument set-up wizards for Bioscan instruments and has facilities for working with other instrumentation. BioChrom is the perfect complement to your Flow-Count, Mini-Scan, AR-2000, PET Metabolite, and Triathler-HPLC systems. BioChrom offers the researcher the facility to create and edit methods, set up sample runs and view data collection in real time for a variety of radio-detection instruments. BioChrom is designed to work with radioactivity measurements in HPLC and TLC systems and has features such as half-life correction for short-lived isotopes, real-time data display, manual or automatic peak finding, autoscaling, and customized reporting. Choose BioChrom Lite for most applications and users working in non-regulated environments and BioChrom Plus for full cGMP and 21 CFR Part 11 compliance including audit trails. An annual comprehensive support option is available to provide you with full telephone/email/fax support services direct from the programmers. Founded in 1980, Bioscan has supplied customers with unique research productivity tools for more than 25 years. There are no threads in Bioscan BioChrom Reviews at this time.